Precast Concrete Site Furnishings | Petersen Manufacturing Co. Inc.
Precast Concrete Site Furnishings - Petersen Manufacturing Co. Inc.
Petersen Manufacturing precast concrete Site Furnishings can provide the strength, flexibility and aesthetic value necessary for commercial or residential projects. 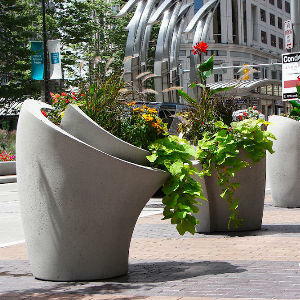 Choose from many styles of planters, bollards, tables, trash receptacles and benches. The quality of Petersen Manufacturing precast concrete furnishings is unsurpassed in the industry. Petersen Manufacturing creates precast concrete site furnishings for world class organizations across the country and around the world. Please take a moment to navigate our site. Within you will discover a wide array of Precast Concrete and Metal Site furnishings, as well as our extensive line of security barriers. Whether you need just one planter or ash urn for a small operation, or hundreds of tables and waste receptacles to address the needs of larger facilities, we have the right product for your particular need. All of our precast concrete products are steel-reinforced, and built to meet or exceed any industry standard for strength and durability. Also, all of our products are available in a wide variety of aggregate textures and colors to put that finishing touch on your project. Each piece of our Metal Site Furnishings is handcrafted, using high quality steel. The product is then cleaned, treated, and powder coated, using the finest powder coating materials available. Feel free to ask about our wide array of colors, and very competitive lead times as well. If you have any questions on our products, prices or shipping, please call us toll-free at 1-800-832-7383 to discuss your project with one of our helpful representatives. Or you can e-mail your questions and requests to sales@petersenmfg.com. We hope to hear from you soon! Installation is available by Petersen Mfg.